It all started with two friends and a dog. When it was first decided that Echo, the dog, would start going to doggie day care at Camp Run-A-Mutt, we had no intentions of making dog treats. After seeing the amazing facility, meeting the equally amazing staff, and having it suggested to us in passing we decided to give it a go. Thus, Echo's Friends' Cookies was born. We started baking in March 2013 and strive to provide healthy, fun, and tasty treats for all dogs. We take great care to ensure only the best ingredients are used in our treats. That means gluten, soy, corn, and GMO free only for your pups. Echo came to us through Danielle's brother and Danielle recently became Echo's mommy. We've known this precious pup since she was only a few weeks old and have always loved her immensely. She has recently started going to doggie day care at Camp Run-A-Mutt and just loves playing with all the other dogs there. We also take her to the dog park to play with us as well as other dogs. She loves being around people and adores attention. Echo also enjoys running errands with mom and auntie (any car ride actually), going to grandma's property to chase squirrels, and playing with Starla the chicken through the coop's door screen. She has a love/hate relationship with Starla and is learning to play nice with the chickens. 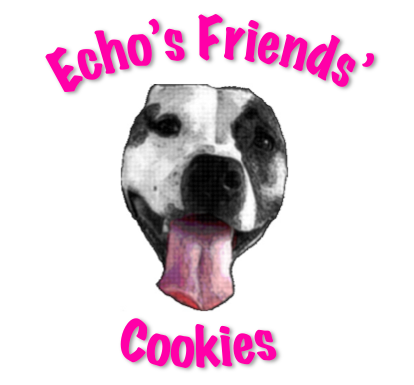 We're very happy to be there for her and she's very happy to be our taste tester and the face of Echo's Friends' Cookies. Echo's friends are Danielle and Lindsey, the bakers behind all the tasty treats. They do most everything together and are always in the kitchen making something delicious. Danielle is Echo's mommy, a script supervisor, and a pastry chef. She has a blog, Film Making and Cookie Baking, where she talks about her garden, her work, her chickens, her cooking and baking, and Echo. Lindsey is Echo's auntie, Danielle's close friend, a drag racer, and jewelry maker. She, too, has a blog, Craft Making and Drag Racing, where she tells about her racing, her cooking and baking, her crafts, and Echo. Echo's other friends are Danielle's three chickens, Starla, Lucy, and Ethel. These three provide the GMO free and soy free eggs that are used in Echo's Friends' Cookies. Danielle and Lindsey hope your dog enjoys these treats made by Echo's friends for Echo's friends.